A case from Florida asks the question if a police dog’s behavior outside a house gives the officers the right to get a search warrant for illegal drugs inside the home, or does a dog’s sniff amount to a constitutional search? The Florida Supreme court said that the dog’s ability to detect marijuana inside a home from the outside of a closed front door breaches a constitutional line. The Florida state attorney, Pam Bondi, is hoping that the Supreme Court of the United States will overturn that ruling. Legal experts agree that the Court will, in fact, hear this very important case and make a ruling.The Supreme Court could decide this month whether to take the case, the latest in a long line of disputes about whether the use of dogs to find drugs, explosives and other illegal or dangerous substances violates the Fourth Amendment protection against illegal search and seizure. The case is being monitored by law enforcement agencies across the country that make use of dogs in the search for illegal substances. 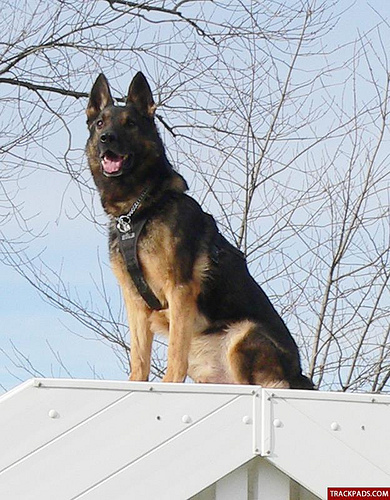 The dog in question, Franky, is now retired but is responsible for the seizure of more than 2.5 tons of marijuana – and $4.9 million dollars of drug-contaminated money. The chocolate lab spent most of his career sniffing around the nation’s airports. The U.S. Supreme Court has heard four dog sniffing cases before – two of the previous cases involved the use of drug dogs after a traffic stop, one involved airport luggage, and the other one involved a package in transit. If they agree to hear this case, it will be the first one that deals with a dog and a private residence. Time and again, the U.S. Supreme court has ruled that the home is entitled to greater privacy than roads or public places. The justices ruled in 2001 that police could not use thermal imaging technology to detect marijuana growers from outside the home since the equipment could also detect lawful activity, such as intimate details about when the occupants were bathing. And it is already well established, that officers can knock on your front door, but if you refuse to open up and talk, the officers need to get a warrant to come inside. The case is Florida v. Jadines, and in it, Joelis Jardines was arrested in 2006 for trafficking after police found 179 marijuana plants in his home when a drug dog detected smells from outside his door. His attorney challenged the search saying it was an unconstitutional intrusion into his home by law enforcement. The evidence was thrown out in a lower court, then reversed by an appeals court, but the Florida Supreme Court ultimately sided with the original judge. The recent decision has created a conflict within Florida as earlier rulings decided that a dog’s sniff does not amount to a search. “Decided by a nose? Court ponders drug dog’s sniff,” by Curt Anderson, published at AJC.com.